When I was offered some coffee to review, I was a initially a little hesitant. Coffee is not my favourite drink, nor is it my favourite flavour. But, since commencing this blog, I have been using it more and more to add an additional depth to chocolate cakes and find it works really well. I am not averse to a cup of coffee, it’s just not something I ever think to drink. The smell of roasting and brewing coffee is another matter entirely and usually has me going weak at the knees. In the end it was Puro’s ethical stance that swayed me and got me brewing. As the name suggests, Puro Fairtrade Coffee is a fairtrade brand, certified by the Fairtrade Foundation and belonging to Belgian company Miko which has been roasting coffee for 212 years. Some of its coffee is also organic, although not certified by the Soil Association, the certifying body I trust most. Miko won an award last year for its partnership with the World Land Trust and its work in helping to protect the rainforests of South America; the trust is also supported by David Attenborough. A total of 8103 acres of rainforest in Brazil, Ecuador and Colombia have so far been saved and are now protected from logging. This may not seem a lot in the grand scheme of things, but it’s certainly a step in the right direction. One new tree species, 12 orchids and one frog have all been discovered in these areas since they became reserves. One of the orchids is now known as the Puro orchid! I was also pleased to find that Miko produces all of its own electricity via solar panels. You can find out more about the Puro story by watching this short clip. When the coffee package arrived, I was ridiculously excited to find it all wrapped up in a hessian sack just like a sack of bona fide beans. I had a very good feeling about it from then on in. Diving into the bag was rather like a Christmas stocking; pulling out one lumpy unidentified item after another was an enjoyable guessing game. Not only did I pull out three 250g packets of coffee, but also a 3 cup cafetiere, a Pura cup and saucer, a pack of individual hot chocolate sachets and some sugar sachets too. As neither CT nor I are coffee connoisseurs, I invited some more knowledgeable friends around for a tasting. I used the cafetiere provided to make three brews of filter coffee and we tasted them blind. First off, we breathed in the aroma, then tasted them black and finally added milk. The results were very interesting to my untutored palate – it seems quality will out. Arabica is meant to be the premier coffee species and the one with the highest percentage of Arabica to Robusta, was the one we liked best. Like chocolate, it seems that the best beans are grown in South America with the more standard everyday ones grown in Africa (Congo). That said, we liked all of them. Each bag came with a hand written label showing type, origins, content and description – all are fairtrade and shade grown. I’ve written our tasting notes first, followed by Puro’s own in italics. We did not read the descriptions until after we’d done our own tasting, but as you can see our notes echoed theirs. The complex character of this blend comes from the mild and smooth yet floral Guatemalan high grown Arabica skilfully blended with the Peruvian Arabica for a perfect balance of flavour. Through the addition of premium Robusta, a hint of dark chocolate is injected into the cup. This amazingly delicate blend is distinctive in flavour. It combines beautifully soft notes of chocolate with citric overtones that gives it a fruitiness whilst adding natural sweetness. Wow, good morning and a warm welcome from this intense fiery blend. This dark roasted blend of high grown Arabica with the finest Congo Robusta creates a warm balanced cup with lively fragrant flavours, which when added to perfectly tempered milk create a bitter sweet chocolate. To accompany the coffee, I made some coffee biscuits with whipped coffee chocolate ganache. For a change, I thought I would make coffee the star of the show rather than chocolate and much to my surprise, I found these biscuits to be utterly delicious. The Puro Fuerte, being of a robust nature, was an ideal coffee with which to flavour the biscuits. They proved to be very popular. Puro coffee is drunk in a number of locations including all National Trust sites and Royal Parks. Each month there is a chance to win a coffee pack by entering a caption competition on Puro’s facebook page – definitely worth a try. 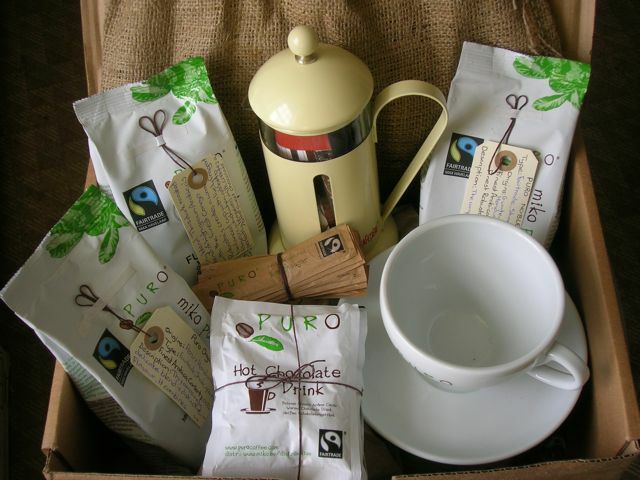 Puro Fairtrade Coffee have kindly offered the same coffee hamper as I received as a giveaway on Chocolate Log Blog. Prizes are offered and provided by Puro Fairtrade Coffee and Chocolate Log Blog accepts no responsibility for the acts or defaults of said third party. If you need some help to enter using Rafflecopter, here’s a quick clip to show you how. Wow sounds great and different to other coffee. I love coffee – as a drink and as a flavour. Those biscuits look superb. … and I think the Puro Organic, “strong but not too bitter” sounds like my sort of thing! I like the sound of Fuerte – I love my coffee strong! I recognised this brand from when I used to work in a restaurant at a National Trust property near Plymouth – I had a couple of lattes and it is definitely very nice! Puro Noble, sounds a tasty smooth drunk. Look forward to sharing some more Puro Fairtrade Coffee with the winner. Would have to be the Puro Fuerte, I like my coffee strong and gutsy! Puro Fuerte: I need something strong in the morning. Probably the Fuerte as I tend to like my coffee more at the chocolatey end of things than the citrussy end, and you didn’t give the other chocolatey one such a good rating! I’d like the Puro Fuerte .. I love a good bold coffee to get me going! I would like to try Puro Fuerte its sounds like my sort of coffee I like quite strong coffee it keeps me going all day long and I drink quite a lot of coffee everyday. I think my favourite would probably be the Puro Organic, strong but not too bitter sounds perfect. I don’t know, they all sound pretty great. I think the Puro Organic might be most like what I drink. I think Puro Noble would be my favorite. Puro Organic – Rich and creamy smooth,the finishing touch following a tasty meal, and also a delicious mid-morning cuppa to enjoy on its own, or with a biscuit. I think the organic one sounds more suited to me – i like the sound of a chocolate taste. The Puro Organic sounds lovely! I don’t drink coffee, but love to use it in the baking. Smell so good! I think I’d go for the Puro Organic but as I am a complete coffee addict, I don’t think I’d turn down a cup of any of them! Love your biscuits, sound delicious! The Puro Fuerte sounds like it’s got the balance right and I would love to give it a go! Puro Orgaic; I like the idea of the chocolatey taste! I’d like the Puro Fuerte – I don’t often drink coffee but when I do I like it to pack a punch. I like the sound of Puro Fuerte, nice and strong, perfect for waking me up in the mornings! Puro Fuerte as I have been fortunate to go to Peru and this was served in the morning with hot milk, I have to say I could not get enough of it, superb flavour, aroma and wow what a wake up call! Puro Organic — if it tastes like chocolate, I’m there. I’d love to try the Puro Fuerte! Puro Noble sound really delicious. Puro Noble would most likely be to my taste. Puro Organic would be lovely. Pure Organic sounds lovely as I love chocolate! Puro Fuerte sounds the nicest! Pure Fuerto I think, I like a strong flavour to my coffee. Make mine a Puro Organic with couple of bickies please!! Nice rich Puro Fuerto. Make it a double with gusto! The Puro Organic sounds just my cup of tea !!!! I would think Puro Fuerte – I like my coffee strong! Puro Fuerte- nice and strong! Puro Organic – with the added bonus of chocolate flavour – yum! Puro Organic sounds just lovely. Puro Fuerte. Love my coffee black with a rich full flavour. Puro organic sounds great! Lovely giveaway! I like the sound of Puro Noble. They all sound good but Puro Organic sounds the most matched to me! Puro Noble, for the smoothness. Puro Organic. If I’m correct you can get the taste, creamy texture and the satisfaction of chocolate without the consequences to your waistline…then what’s not like? Puro noble sounds just right for me! I would like to try all of them to be truthful as I find it difficult to find a coffee I truly like. Maybe a mellow one would be good to start with. I’m sure I’d love the Puro Noble blend – I like coffee quite strong, but drink it all day. Puro Fuerte – I NEED a wake-me-up in the morning coffee. Puro Fuerte sounds good and would love to give it a try! I love organic food so the organic one would be the one I would choose. As I love my coffee I really enjoyed reading your review here! I’ve just become a big coffee fan so this would be fabulous, Pure Organic sounds beautiful! Puro Noble sounds nice and smooth, I don’t like strong. Puro Fuerte – love a strong coffee! Puro Organic sounds really lovely and indulgent. Definitely like the sound of chocolate taste on the puro organic! The Puro Noble sounds lovely. I like it strong so Puro Fuerte for me. puro noble sounds very elegant! Puro Organic, I like the sound of “chocolatey”! The Puro Organic blend sounds lovely, especially the part involving a hint of chocolate. Puro Organic sounds like it would be my favourite – of course I might have to make those biscuits to make sure..
Puro Organic 🙂 Cannot beat aribica beans! Would have to be Puro Fuerte to wake me up in a morning. I would go for the Puro Organic. Puro Organic – Sounds lovely!! I think Puro Noble for me, but they do all sound lovely! Puro Noble as it is strong! The Puro Organic sounds amazing! Oven made coffee is a must try. Puro Fuerte because i need waking up in the mornings. Puro Fuerte sounds lovely and strong, just as I like it! these all sound good,but i think that Puro Noble would be my favourite.fingers crossed to win this and i will let you know!!! Puro Fuerte, I like the even balance of the arabica and robusta beans. You get a stronger flavour overall but the undertone os still mild and creamy. Puro Organic sounds so healthy would love to try for a nice change! Puro Organic – you cannot go wrong with Arabiaca coffee. They all sound lovely! Probably Puro Organic though. I think the Puro Organic would be my favourite, I love coffee but don’t like it too bitter! Pure Organic – I’m such a coffee addict! Puro Fuerte – strong and refreshing! Puro Organic, Sounds delicious I like the thought of creamy chocolate. Puro Fuerte sounds gorgeous to have in the morning..
Puro Fuerte – it sounds deep, rich and complex quite like myself apart from the rich part!! Puro Fuerte! A wake-up coffee sounds just what I need! haha! I think Puro Organic would be my favourite. Puro Noble I think, although it would be nice to try them all! Puro Fuerte sounds closest to my taste! Mmm Puro Organic I think! I love coffee – as a drink and as a flavour. Puro Noble as I like a smooth coffee and its mellow and well balanced flavour is the total opposite of my personality!! the puro noble sounds delish! Puro Fuerte would definitely get me out of bed in the morning! I think I like the sound of the Puro Noble for early morning and the Puro Organic after a meal with friends. Puro Noble sounds perfect for me! Puro Noble sounds perfect for me. Puro organic, those chocolatey flavours sound delicious! I’d love to wake up and smell the Puro Organic coffee! Puro Organic for me I think, although all sound lovely! I like the sound of the Puro Organic. I like the strong one – puro fuerte- just the thing for waking me up in the morning! I like my coffee how i like my men – hot, strong and rich – haha! Puro Organic – because of the chocolate flavour. puro noble for me please. Coffee doesn’t always love me but I try to have good coffee when I can.